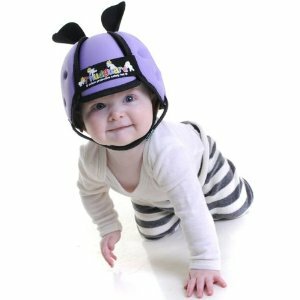 There’s always been that joke about putting your toddler in a helmet, but that’s exactly it, it should have stayed a joke. No one ever wants to put their child in harm’s way, of course, but the little bumps and bruises seem to just be a part of the trial and error of learning how to walk. It’s best to keep the helmet at bay until your child learns to ride a bike, trust me. Of course, there will be times when you need to give your child a time out when their behavior is just unacceptable and you need to teach them a lesson, however, a time out pad might just be a little excessive. This special pad makes sounds and turns the entire thing into a game, when it isn’t supposed to be fun. Your child should not be asking for time outs, stick them in a chair instead. Here’s an invention, a cardboard box for your babies to sleep in that can be customized, for only $250.00. For, what? Let’s rethink this for a second, sleeping in a cardboard box usually qualifies as homeless and there are plenty from opening the presents other people got you if you really want to throw your child in this. Take a sharpie and write their name on the side. A battery operated nasal clearer? What does this even mean? Whoever marketed this really had the wrong idea of putting all of these words into the title of the product. Babies generally don’t even like aspirators, so throwing this one at them isn’t going to really make them laugh and giggle, more like they’ll be traumatized. Send it back. We understand that all babies like having hands on them, cradling them when they sleep, that’s why they are little and have parents. It shouldn’t be necessary to get this infant pillow that mocks hands, but is just hands, disembodied cradling a child. How can you not get creeped out by this? If you enjoy it, you probably shouldn’t have had children, just saying.